I read a total of 17 books this month, and two short stories. This is over twice the books I’ve been reading in the last few months. But I suppose being stuck inside the house with temperatures the same as the Antarctic outside might be the reason. Yes, it’s really cold here…the morning that I’m writing this, it was -30ºF (-34ºC). Several people in Midwest have already frozen to death. How heartbreaking! Anyway, unlike my usual wrap-ups, this year I’m going to include a short update of my reading resolutions/reading challenges I am hoping to complete. So, let’s see how I did. Read 1 Indie book a month: I didn’t do this, but I should be able to read two next month. Read more challenging books: I did a lot of this, from theology to Chinese poetry. Reread some books: This month I reread The Frog Princess series by E.D. Baker. The Year of Asian Reading Challenge: I read 3 of my 51+ books. Back to the Classics Challenge: I read 1 of 13 books. I’m on schedule for most things, so let’s get into my star rating mini-reviews. I didn’t have any for one star (exciting!). 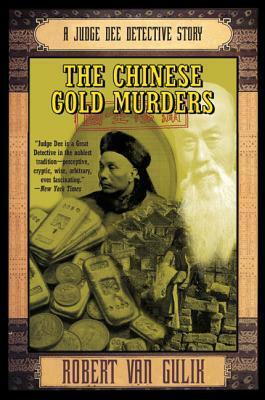 I loved the first book of this series, which is simply van Gulik translating a classic Chinese novel. Imagine my disappointment, then, when I read this and didn’t like it. The characters feel too different from the first book, even if this is supposed to be a prequel, set at the beginning of Judge Dee’s career as a magistrate. Whereas in the first book the characters felt realistic to the time and place, some of the characters’ judgements in this book felt more modern and out of place for the setting. Like the first book, the plot interweaves three cases. But where the first book took time developing each case before moving on to the next one, this one throws you into all three cases within the first fifty pages, making it nearly impossible to keep track of what clue or witness goes with each case. Saying that, the only reason I gave this book two stars instead of one is that it is clear that van Gulik knows a lot of the era and many of the details are rich in historical accuracy. It is just also clear that he is a better translator than he is an author. Perhaps I am being too harsh on this book, for its sequels may be better. I’m just still deciding if I’ll read them or not. I have never been able to keep an actual journal, because there are so many other things I write in an average day. But since I was little, I’ve loved sketching random things. I’ve gotten away from it in recent years, and I got this book in hopes of getting back into it. While it’s a pretty book with lovely art, it didn’t really say anything helpful. For example, learning different techniques to draw, like sketching and water coloring. It’s more of a self-help book, whose main message is to, “Just do it.” If that’s what you’re looking for, this book is for you. But, for me, I was looking for a more of a concrete book. It’s not horrible, but not great either. This is an extremely heavy book filled with essays by different Chinese historians on the topics of the Qin and Han Dynasties, in particular the art and artifacts found in the last few decades. This book was fascinating to read, and I loved the pictures. However, for me the essays were hit or miss. Some of them were amazing, and others were repetitive and shallow. Thus, I would give some of the essays 5 stars and others 1 or 2 stars. Thus, I thought I’d meet it in the middle with my rating. I loved the first book of this series, and the second one, while not as good, was enjoyable. But this one wasn’t quite as good as either for one simple reason. THIS IS NOT A MYSTERY! It’s a thriller. The difference is that the culprit is hidden until the end in a mystery, while in a thriller the intrigue comes from capturing a known killer. I’m not a massive fan of thrillers, which is why this one missed the mark for me. You know who the murderer is by the first chapter. It’s that simple. I was hoping for a great plot twist at the end, but it never came. Saying that, if you like thrillers, this isn’t a bad book. It’s well-paced, mostly filled with dialogue, and the characters are the same as the ones I enjoyed in the first two books. But it’s definitely not half as good as the first book. Lovecraft can set a creepy mood like no author I have ever read, and this short story is no exception. While the story is rather simple, as two men descend into caves and only one returns, it is the vivid description and the theme that the unseen is more terrifying than that which is seen which makes this story so good. Apparently, this story came from a dream Lovecraft has. Really, this guy has weird dreams! I enjoyed this book for the most part, though being an avid reader myself it became clear that this book is geared more to people who rarely read. The chapters are ridiculously short (anywhere from two to six pages) and none of the concepts are thoroughly analyzed. Also, this book makes the assumption that everyone reading it already has a basic belief in Christianity and just want to grow in their knowledge of Jesus. Saying that, being a Christian myself, this didn’t bother me too much, but it’s definitely not a book if you’re looking for proof that Jesus existed or that he was divine. It makes for a nice, quick read, though I personally prefer Matthew Kelly’s lectures better. You see a lot of books and blog posts about the top 10 books to read, but 1,000 books? Wow, that’s a lot! And I’ve only read about 72 out of the 1,000 books. This book covers extensive genres, nonfiction and fiction alike. While some of the selections seemed unnecessary (like Gone Girl…I mean, really?) and there were certainly more books I would have added (like there was only one Chinese classic…where was Journey to the West? ), I was mostly happy with the selections in the book. Let’s just say my TBR grew twice as much overnight. Though some of these books I had already planned to read, I was happy to find a lot more books I had never heard of that look so good. It’s a great book to give you ideas for books to read! This book is filled with absolutely mesmerizing pictures. While there are no hidden gems, most of the famous places in China are covered. The only complaint I had (reducing my five stars to a four) is that the info of each picture was in the back, so I ended up going back and forth from picture to the information. If each page had a small caption, it would have been much more understandable. However, I really enjoyed this photography journey. I’m not a massive fan of poetry in general, but I do love Chinese history. For me, the poems weren’t as interesting as the explanation of them. Li Po and Tu Fu were definitely men of their time, as it was common for scholars to try their hand at poetry. And some of their poems are really interesting, painting a picture of both how life was during the Tang Dynasty as well as how differently they each saw the world. Li Po takes a more cynical view of the world, whereas Tu Fu seems to be more flowery in his writing. It’s a fun book to read, both if you like poetry and if you’re interested in Chinese history. This is one of the oldest deciphered writings still around today, so I was curious to read it. It’s fascinating to read, a bit like the Ten Commandments, except with more death and just horribleness in general. Seriously, so many of the laws end with, “he shall be put to death.” I mean, a bit harsh. However, it’s interesting to see how similar these laws are to many lists of laws around the world (from Ancient China to the Bible), like don’t steal and laws of bequeathing property. This makes for both a quick and fun read, and I highly recommend it if you are interested in ancient history. So there you have it! I read a lot of books this month, and currently I’m happy with all my progress on my different reading endeavors. But I suppose I feel more in the mood to read when it’s freezing outside! Posted on February 2, 2019 January 30, 2019 by Madame WriterPosted in ReadingTagged 2019, book review, china, fantasy, religious, short stories, wrap-up. You’ve kicked off the first month of the New Year with such great accomplishment! Kudos to you! And I hope it’s getting warmer and warmer in America! I haven’t heard of Strange Tales from a Chinese Studio. I’ll have to look it up. I love books about strange phenomena! And yes, it was interesting to read how different Li and Du saw the world, though they were close friends. As for translations, I’m sure it depends on who is translating it. Some English translations are horrible, but this one was surprisingly good! And it has gotten a bit warmer in America, though now we currently are getting about two feet of snow (0.6 meters). So lot’s of shoveling is ahead of me! Thank you for all your amazing comments! I haven’t finished the book by Pu yet but I watched dramas based on the classic when I was about 10 years old. And I loved it! It is said that Pu created those imaginative stories to indirectly criticize the sociey of his time. I hope the English translation is great! I loved The Frog Princess book series by E.D. Baker! I got the entire series as a gift one Christmas and I think I finished them all before school started back up. Thank you for reminding me how good they are. I’ll have to return to them this year! Yes, they are amazing! I enjoyed rereading them as an adult. I hope you do as well! I’m really interested in The code of Hammurabi, but you’ve read a lot of interesting books! I’m so worried hearing the news about the polar vortex, please stay safe and warm! Yes, The Code of Hammurabi was a really interesting book to read. And it’s actually warming up, so I have hopes that the cold is over for a while! The Code of Hammurabi make me curious. I am a history buff. Thank you! I quite enjoyed it, and it’s a pretty quick read. It’s interesting to see what laws were made during the time. The laws sounded quite brutal and unforgiving.